Be first class, not first crass. From being confined in a limited airline space to getting lost in translation, travel can unleash the best and worst in us. Don’t let travel woes turn you into the insufferable tourist! Before you book your next trip, heed these tips to become a more #woke traveler. Do you like taking off your socks and placing your stinky feet on the armrest in front of you? Eww! Does your long, greasy hair drape on the back of your seat, covering someone’s TV screen? Double eww! Are you aware if you’ve invaded someone else’s personal space? Do you like spritzing your strong perfume mid-flight? Remember the classic Confucius saying, “Don’t do unto others what you don’t want done unto you.” If you hate dealing with other passengers’ with poor hygiene, channel good karma by setting a good example yourself. Otherwise you may end up on Passenger Shaming, an Instagram account dedicated to the worst plane passengers worldwide. 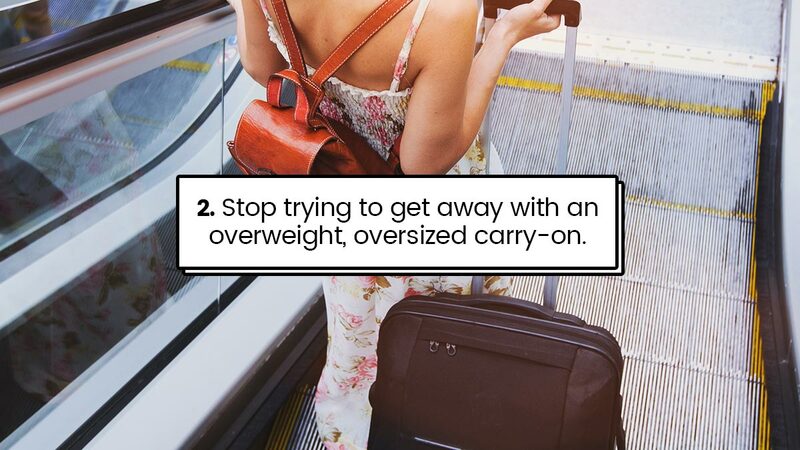 Stop trying to get away with an overweight, oversized carry-on. Sure, your Tita proudly got away with it once or twice, but don’t push your luck. Flight attendants can spot these annoying overweight malletas a mile away, and not even your most charming smile will prevent the FAs from doing their job and singling you out. Aside from your hygiene, please also watch your travel etiquette. Be polite when communicating with fellow passengers and airline personnel. More rules of decorum: Dress decently, respect other passengers’ private space, recline your seat with caution, avoid getting drunk, and don’t act like a diva. When exploring a different country, take note of their cultural norms and dress codes. Some hand gestures or acts that are completely normal for your country may be offensive in others. In this era of vlogging and social media posts for the sake of likes, all the more we need to watch our manners. Think long and hard before doing that bikini yoga pose in front of what could be a revered religious structure. As permission before taking photos of the locals. When in doubt, just don’t. Lower the volume of your chatter. Nobody wants to hear your boisterous conversations in the plane, especially when the cabin lights have been switched off and passengers are trying to sleep. Even when people are starting to wake up and eat their airline meal, the last thing they want is to hear your loud chismis. Remember: The airline cabin is not a coffee shop. Look around you. If you notice that your immediate neighbors are shifting in their seats uncomfortably, looking over repeatedly to give you the stink eye, and plugging their earphones, it may be a sign that you’re the loud, annoying one. Do you really need to applaud after landing? There’s an ongoing debate on whether or not it’s tacky to break into applause after the plane has landed. If you’re in a flight full of OFWs who haven’t set foot in the motherland for years, this emotional reaction may be acceptable. If you’re landing after a quick one-hour flight or an average international trip, there’s really no need to clap. Save the applause for when the entire plane has escaped a near-death experience and you’re grateful to make it out alive. For the love of God, avoid photo shoots in front of the airplane. Filipinos have become so notorious for taking photos (complete with selfie sticks and 100 poses) in front of a plane that our local airlines now regularly announce before landing, “For safety reasons, loitering and picture-taking at the ramp area is strictly prohibited.” Guess which nationality still tries to pull it off, thus causing the delay of disembarking and eventually, the departure of the next flight? When the FA announces, “Do not stand up to get your overhead luggage until the plane has come to a complete stop and the fasten seatbelt sign has been switched off,” please listen. Do not be the overexcited Tita who completely ignores the rule and wants to be the first to get her carry-on malleta (see #2) like there’s a contest. As with other rules imposed in restaurants, public modes of transportation, and other tourist spots, please do not give your fellow Filipinos a bad name by being pasaway. Don’t be a petty fraudster. Security guards and personnel in touristy areas know that you will try to use your one-peso coin to buy a soda can or candy from their vending machines because your Philippine coin is the same size as their more expensive currency. Vending machines are now more sophisticated and won’t be fooled into taking the wrong currency. The last thing you want is to be approached by security because your one-peso coin got stuck in the gumball machine that requires a US quarter. Avoid trying to get away with little cheats that you think nobody will notice when you’re abroad. Walk and bike more to not only lessen your carbon footprint, but to also avoid vacation weight gain. Lessen your plastic waste by packing reusable grocery bags, water bottles, and eco straws. There are usually two kinds of people in the airport and bus/train terminals—a.) the smooth-sailing pro with only one or no carry-on bag and breezes through immigration, and b.) the disorganized, flustered one who’s trying to get away with multiple carry-ons and is always fumbling through her messy bag to look for her travel documents. To avoid being the latter, learn to pack like a pro. Bring a maximum of one carry-on bag. Organize your bag and pockets to help you easily find your important documents and personal items. Visit Kate on KateWasHere.com and follow her on Instagram and Twitter.